The 22-year-old, born in Preston, lost 21-17, 15-21, 21-18 to Malaysia’s Soniia Cheah in the women’s singles clash that forms part of the team event on the Gold Coast. England – silver medallists in this team event four years ago where they also lost to Malaysia – were convincingly dispatched overall by the defending champions on Sunday. But Birch pushed her singles opponent – the fifth seed for the individual event later on in the Gold Coast – all the way. “That one is pretty tough to take, it was there for the winning,” she said. “I put everything out there today and she just closed it out better than I did. 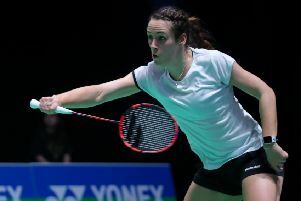 There is still the bronze medal match to come for England in the team event before Birch will switch her focus to the singles, and this result has given her renewed confidence. “I definitely take a lot from this, coming into this from yesterday and today, it has been two good performances so I cannot be too disheartened,” she added. “She is a very experienced player that has performed at the top of the world and I have not quite got there yet. Elsewhere, Natalie Haythornthwaite impressed as England downed Uganda 55-49 in the Pool stages of the netball. The 25-year-old, playing in her maiden Games on the Gold Coast, made seven shots from seven and chipped in with four assists as England closed out victory that puts them top of Pool B with three wins from three. Finally, Anna Hopkin continued her strong week as she booked her place in the final of the 100m freestyle in the pool. Hopkin shaved four hundredths off her heat swim, to go 55.17 and sneak into the final.